This chicken is delicious hot cold or at room temperature. The green sauce is made with either cilantro or basil. I love both, but as my basil bushes grow tall this summer I know which I will be using. This would be a great meal to serve for entertaining since everything can be done well in advance – just cut your corn and tomatoes and give them a quick sauté right before serving. Note: This can easily be adapted to use all chicken thighs or breast, or wings if you want a combination of cut up chicken, put them in separate roasting pans as the dark meat will take longer to cook than the white. This combination so simple and goes so well with the chicken and green sauce. 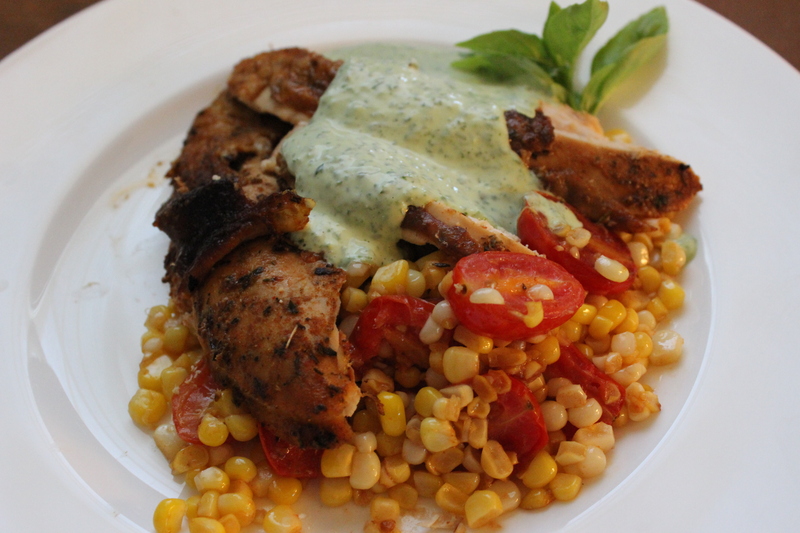 This entry was posted in Recipes and tagged Basil, chicken, Cilantro, Fresh Corn, green sauce, Peruvian-Style, sauces, Tomatoes. Bookmark the permalink.